A newly declassified document obtained by a nuclear historian reveals that the Manhattan Project scientists who designed and detonated the first atomic bomb estimated that 10 to 100 enhanced "superbombs" would produce enough atmospheric radiation to wipe out the human race. Although the development of sophisticated nuclear weapons was still in its infancy, scientists at the Los Alamos laboratory and test site could foresee the technology's grim potential. "The 'Super' they had in mind was what we would now call a hydrogen bomb," historian Alex Wellerstein tells Business Insider. The bomb-makers believed it was possible to construct a weapon with as much deuterium—a nuclear variant of hydrogen—as they wanted, creating an explosive yield as high as 100 megatons. By comparison, the atomic bombs had a yield of approximately 15 kilotons, or 0.015 megatons. The Los Alamos scientists understood the threat that airborne radiation would pose in the event of nuclear war. "Atmospheric poisoning is basically making it so that the background level of radioactivity would be greatly increased, to the point that it would interfere with human life (e.g. cancers and birth defects) and reproduction (e.g. genetic anomalies)," says Wellerstein. In recent decades the total yield of U.S. and Russian nuclear weapons has fallen, such that "the threat of over-irradiating the planet is probably not a real one, even with a full nuclear exchange," Wellerstein wrote. "A bigger concern is the amount of carbon that would be thrown up in even a limited nuclear exchange (say, between India and Pakistan), which could have detrimental global effects on the climate." The 1945 estimate seems to have advised caution in the new, uncertain nuclear age. The scientific push to learn more about the destructive weapons that were so hastily researched and used in the 1940s resulted in important insights as to the consequence of their use. 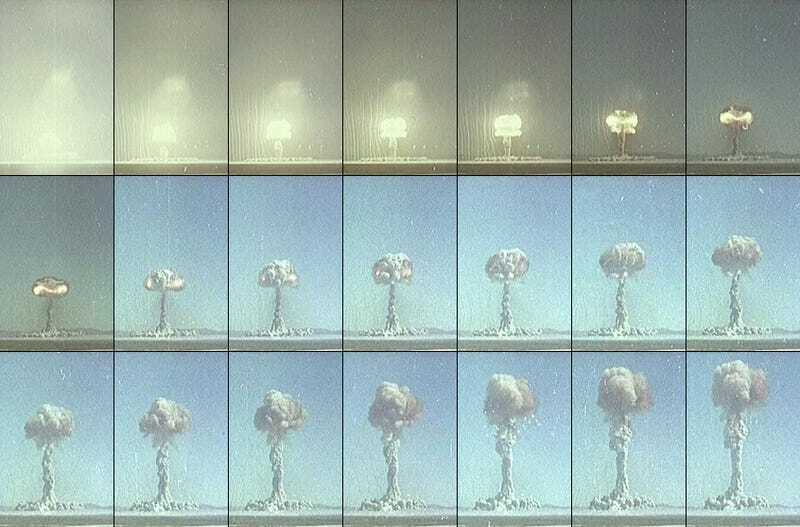 Nuclear weapons aren't just horrific on the intended, local scale. Indeed, after the Second World War, scientists and other activists campaigning for the reduction or abolishment of nuclear weapons made it a point to emphasize that nukes couldn't be thought of merely as more destructive versions of conventional bombs. The use of these weapons could impact our world's ability to foster human life. Not long ago, in a coffee shop, I met a milk-wagon driver who was convinced that if he built a masonry house, he would be safe from A-bombs, H-bombs…nobody's ever explained to him that [local] fallout is one thing and atmospheric radiation is another.